Nova Scotia, Latin for ‘New Scotland’, is one of the three Canadian Maritime Provinces, situated just off the country’s east coast. As the second most densely populated province in Canada, it’s home to over 900,000 people in just 55,000 square kilometres. Consisting of a large peninsula known as the mainland, connected to New Brunswick by a narrow strip of land, Nova Scotia also includes Cape Breton Island which is linked by a recently built causeway. But despite its relatively small size and population, it is incredibly diverse, with the local ancestry including Scots, French Acadians, the indigenous Mi’kmaq people and many more. A cultural melting pot, Nova Scotia’s scenery is also supremely varied and considered an outdoor playground for all ages. Explore dramatic cliffs adorned with UNESCO World Heritage Site listed fossils, walk along hectares upon hectares of verdant slopes, or find yourself peacefully lost in a pine forest with nothing but the sound of gentle cascades and seabird song in the air. One of the most famous attractions, the Bay of Fundy, contains the largest tidal range on earth which subsequently creates the rare tidal bore phenomenon. Every six hours, over 100 billion tons of seawater rushes in and out of the bay, allowing some of the most adrenaline-fuelled rafting in Canada, along the Shubenacadie River. Arguably Novia Scotia’s prettiest features are, however, its beaches; the sandy shorelines not to be missed include Clam Harbour, Lawrencetown, Melmerby and Rissers. Also, surfing and kayaking can be enjoyed all year round, or you can spend the afternoon spotting some of the dozen whale species inhabiting the crystalline waters. The capital, Halifax, is one of North America’s oldest cities and plays a fitting tribute to Nova Scotia’s maritime history. It saw the worst man-made explosion on earth in 1917 when two ships collided, and was a crucial sea link during the World Wars. Alongside the iconic hilltop citadel, Halifax contains a fully flourished arts scene, lively pubs and well-kept parks. Moreover, like Novia Scotians on the whole, Haligonians are wonderfully welcoming to outsiders. Close to the coasts of the United States and northern mainland Canada, ferries to Nova Scotia come regularly from those locations. 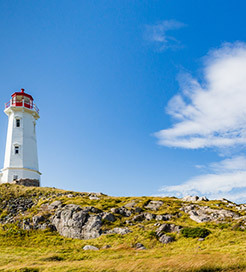 Operated by a choice of leading regional ferry companies, these routes are some of the most scenic in North America, representing a great chance to see whales, puffins and seals along the way. For more information, please visit our Ferries from United States to Nova Scotia page. For more information, please visit our Ferries from Canada to Nova Scotia page. For more information, please visit our Ferries from Prince Edward Island to Nova Scotia page.